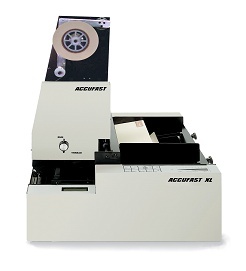 The ACCUFAST XL is recognized as the standard to which all table top labelers are compared. Now, the XL has another roll – literally. By adding a powered roll label head to the XL, ACCUFAST has created a labeler designed to handle the demands of accurate and consistent placement of stamps, RPN’s, inventory, bar code and specialty labels that come on rolls. runs machine-grade labels 1” to 3” wide rolls up to 10” dia. with 3” core. Rolls only.